This badge was issued to Martin Herzfeld on 09 Mar 2015. 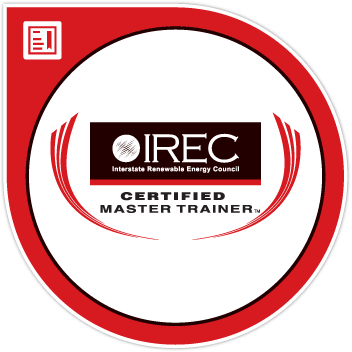 The IREC Certified Master Trainer is qualified to instruct students as well as train other trainers in one or more specific clean energy fields. This trainer is a recognized leader in the field for subject matter expertise. This trainer has demonstrated that their instruction is of high quality and is aligned with the clean energy industry by meeting the requirements of a rigorous standard and third-party assessment. Complete 700 hours of teaching experience. This may be a combination of recent classroom and hands-on lab instruction, and general teaching experience. At least 12 hours of training other trainers and 32 hours of instructional design and development. Complete 150 hours of education experience. This may be represented by a college degree or vocational or post-secondary certificate. This must include at least 30 hours in the last five years of continuing education courses in clean energy technology and at least 60 hours of continuing education courses in pedagogy, training methods, or instructional design. Complete the equivalent of at least one year of hands-on field experience in the field taught. Hold a current relevant professional industry recognized credential or license. Provide documented evidence of meeting rigorous IREC standard. All evidence is reviewed by a nationally recognized third party. Continue to comply with the IREC standard by submitting an annual report. Supply evidence of instructional evaluation. This trainer has met the requirements of IREC Standard 01024: 2013 General Requirements for the Certification of Clean Energy Technology Instructors and Master Trainers. IREC develops consensus-based standards to promote best practices and provide a benchmark for effective and safe workplace training practices in clean energy technology fields.